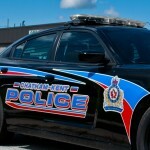 Police are seeking information about a break and enter in Wheatley. At about 11 a.m. yesterday police attended an address on Erie Street in Wheatley in regards to a break and enter complaint. Sometime during the previous evening a business was broken into and a large quantity of copper wire was stolen. Citizens are asked to report any suspicious activity or persons observed with unusual amounts of copper wire or any other similar type of material, especially during hours when most contractors would not be working. Anyone with information is asked to contact Constable Kevin Brown at 519-436-6600 extension 86880. Anonymous callers may call Crime Stoppers at 1-800-222-TIPS (8477) and may be eligible for a cash reward.